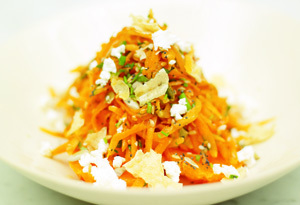 Crisp and crunchy, this raw carrot salad is wonderful alongside a heavier soup. Put a good handful of mixed seeds into a hot, dry frying pan and toss and toast them for a minute. Once toasted, sprinkle the seeds on to your salad. Peel 2 or 3 small clementines and cut into nice thick slices. Either toss these slices into your salad, or lay a few slices on a serving platter and pile the carrot salad on top. Sprinkle croutons over the top. Crumble over some feta or goat cheese on top.